The story and the pictures in “Almost a Full Moon” were cute, but somehow they didn’t seem to mix together in just the right way. It’s still a nice little book. 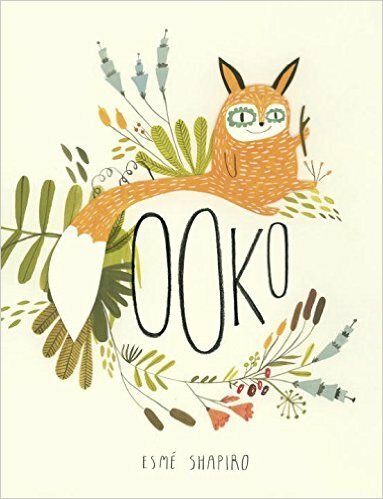 “Ooko” is an adorable picture book about a fox learning the beauty of just being yourself. The simple wording and quirky illustrations will keep children both young and old entertained. I found myself laughing out loud at Ooko’s sense of humor and little bit of sass. Highly recommended! “Yitzi and the Giant Menorah” is absolutely gorgeous. The illustrations may be my favorites that I have ever found in a children’s book. It’s filled with color, and the pages can also be seen as a “hide and seek” type game to find objects contained on all of the pages. The story is also beautiful and engaging. It’s a whimsical story that focuses on many of the traditions of Hanukkah. Books for Jewish children can sometimes be difficult to find. However, it’s also a good book for those who aren’t Jewish! Churches can use it to teach Old Testament traditions, and anyone can use it to expand cultural awareness. An added bonus is a short summary of how Hanukkah came to be on the last page. I’m going to be buying several copies as gifts for all ages this coming holiday season. I only wish I could frame the artwork without needing to destroy a book. What can I say about this collection? Well, it’s “Bob’s Burgers: Well Done,” and the very name “Bob’s Burgers” is synonymous with good comedy. If you’re a fan of the show, I encourage you to get this asap. Actual rating would be 3 1/2 stars. 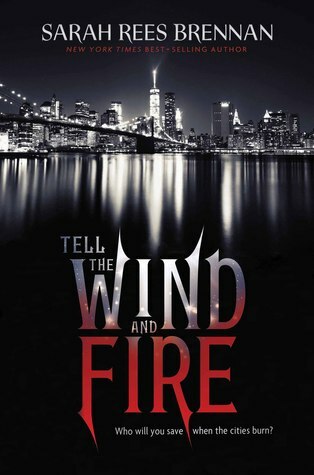 “Tell the Wind and Fire” is a fantasy novel based heavily on “A Tale of Two Cities,” but if you haven’t read that you won’t be lost. I had very mixed feelings on it, ranging from being in love with certain parts to wanting to scream and throw the book at the wall in frustration. The premise was really good and engaging. The world-building was fantastic, and that is always something that hooks me. Unfortunately, the plot was kind of jerked around. Sometimes it was fast-paced and others it was slow. Perhaps the worst aspect was that at times it felt like a good chunk of information was missing, and the reader was expected to infer what backstory led to the current events. It wasn’t enough to ruin the story, but it was an annoyance. The main character, Lucie, was a child born in the Dark City who ended up in the Light. For half of the book she was fierce and relatable. Her dialogue with one character, whose details I will keep secret due to spoilers, was absolutely amazing. I loved their dynamic and wish the entire book had been about them. Then there was Ethan, her boyfriend. The term “flowery prose” does not even begin to describe how she thought of him. It felt like an entirely separate book. Think Victorian era romance, which would have been fine had she not been a strong character literally everywhere else. He was given flaws, some pretty serious ones, that were all but ignored in favor of her falling all over herself over his perfection. The over-the-top relationship almost ruined the entire book. “Tell the Wind and Fire” is worth the read for the good parts, but be sure to be prepared for some frustration. It’s best for high school aged and up. For as long as I can remember, I have been fascinated by the story of the Titanic disaster. I believe this can be said of many who grew up to become historians or develop a lifelong love of history. “The Midnight Watch” is a well-researched novel about the Californian, the ship that watched as the Titanic sank. It’s almost inexplicable why there has been so little written about the events on the ship. The actions of her crew, or more correctly inactions, arguably changed the fate of over 1500 souls. The author has obviously spent a good amount of time researching using primary sources and piecing together a good narrative of what most likely happened. What I enjoyed the most was the actual sinking was a very minor part. The aftermath and inquiries were the main focus, and that is something also rarely focused on. An extra layer of the story is created through the use of a fictional journalist for a Boston paper named Steadman. His pursuit of the truth provided a way to present the aftermath in a way which did not read like a dull history text. I especially appreciated the look into how journalism worked in those days, as well as the beginnings of the women’s rights movement. It was fascinating. Unfortunately, the character himself was someone I found a bit unbearable. That’s the reason for four stars as opposed to five. The crowning jewel of “The Midnight Watch” is a short story included at the end entitled “Eight White Rockets.” There is one section for each rocket. It follows the Sage family, consisting of 9 children and their parents, during the sinking. This was a real family and details of their lives are sprinkled throughout the story. The treatment of third class passengers goes a long way toward explaining how so many children perished. The story also tells about what was happening on the Californian during the same time frame of each rocket. It gave me chills, and I still cannot stop thinking of those children and what might have been. I highly recommend “The Midnight Watch” to anyone middle grade and up who has a fascination with the Titanic and wants a deeper understanding of what happened on that fateful night. Frederick has a lot of rules for himself—like if someone calls him Freddy, he doesn't have to answer them, and he only wears shirts with buttons. But when his friend Angel—his only friend—goes missing and he is questioned by the police, he doesn't have a rule for that. Friendship is a new concept for Frederick, so when Angel asked him to keep a secret no matter what, he agreed. But do the rules of friendship apply when your friend is missing? I can’t say that “Don’t Tell, Don’t Tell, Don’t Tell” is a bad book. In fact, I enjoyed most of it quite a bit. There were a couple of problems that kept it from being a four star book, though. The story centers around Frederick, who has Asperger’s, and Angel, who is only his second friend. Frederick and his wandering stream-of-consciousness voice may be difficult for some to follow, but it’s an accurate portrayal of how many with Asperger’s (or add, adhd, etc.) think. One caveat with this is that people remember: If you’ve met one person with Asperger’s, you’ve met one person with Asperger’s. Think of this as a general view, not necessarily a specific one. Anyway, the situation in which he finds himself is complex for anyone, let alone someone with a different way of processing the world, and the portrayal of how he works through it is fascinating. Angel is a mystery to him, but his observations do develop her character well. However, there is an abrupt shift to her point-of-view that irritated me. Here is a wonderfully refreshing story told by someone with a different way of looking at the world, and it suddenly shifted from his story to hers. We have more than enough books about the neurotypical, and I would have liked to see this one remain Frederick’s. Granted, there is quite a significant event that happens (one I cannot elaborate on because it is a spoiler), so I can understand why the author may have thought it important to switch to Angel, but that event could have been tackled using Frederick. In fact, the handling of it seemed a bit rushed. It was a good thing to include, but I believe more exploration of the aftermath would have been more beneficial. Overall, I can neither recommend nor not recommend “Don’t Tell, Don’t Tell, Don’t Tell.” If it seems interesting to you, give it a try. A promposal that (literally) goes up in flames sparks a friendship that might be just crazy enough to work Hank Kirby can't catch a break. It's not that he means to screw things up all the time. It just happens. A lot. Case in point: his attempt to ask out a girl he likes literally goes up in flames when he spells "Prom" in sparklers on her lawn...and ends up nearly burning down her house. Peyton Breedlove, a brooding loner and budding pyromaniac, witnesses the whole thing and blackmails Hank into an unusual friendship. But when Hank learns about the dark secrets Peyton is hiding, their relationship may turn out to be his biggest disaster yet. I really wish there were a half-star option, because “My Kind of Crazy” is a solid 4 1/2 star read. There is a lot of heart to be found in this book. Mental illness and the topic of not fitting in are heavily covered, but before you think “not that again”, please read on. It is NOT handled in the typical way. First of all, I cannot remember reading any other YA book that tackles pyromania. That alone makes it unique. The issues are presented as serious, but there is a gentle humor in it as well. The problems aren’t made light of, but it does make it obvious that there is humor in almost every situation, and your attitude is as important as anything else in determining the outcome. I promise that sentence will make more sense if you read the book. I loved Hank, Peyton, and the stripper-with-a-heart-of-gold Monica, red tassels and all. Main characters and secondary characters alike are developed beyond the surface. That makes for a nice character-driven read. The feeling of being stuck where you are is something I think many young adults (and adults) can relate to, and it is handled here in a way that has you feeling their hopes and fears as if they were your own. The only problem I had was the ending felt a bit rushed, but that doesn’t take away from the beauty of the story. I recommend “My Kind of Crazy” for young adults and adults alike. If you’ve ever felt on the outside looking in, this is the perfect book for you. It is a good book for reluctant readers as well, since it’s a quick read that doesn’t skimp on plot or character development. Get even. Get revenge. Just don't get caught. Max Cobb is sick of being "Just Max"—the kind of guy whose resume boasts a measly 2.5 GPA and a deep love of heist films. So when an invitation appears in his locker to join the anonymous, untraceable, epic prank-pulling Chaos Club, Max jumps at the opportunity. Except that the invite is really a setup, and Max, plus the four other misfits who received similar invitations, are apprehended by school security for defacing the water tower. Max has finally had enough. It's time for payback. Time to unmask Chaos. Let the prank war begin. “Don’t Get Caught” is hands-down one of the best young adult books I have ever read. It’s a nice break from the tragedy filled contemporary, fantasy, and dystopian genres. Max, the main character, is obsessed with heist films. He knows the list of heist movie rules with the same precision that Randy from “Scream” knows the rules of horror movies. When combined with an unlikely group of very different personalities all on a mission, he is able to put his skills to good use. All of the characters are well-developed and engaging, and all of them go beyond the normal teenage tropes. Think “The Breakfast Club” with a little less angst and a lot more humor. The plot is based around a prank war. I don’t want to go into too much detail, because much like heist films the beauty is in the twists, but I can say that this book had me literally laughing out loud. In fact, it was more of an embarrassing belly laugh that turned into snorts, hiccups, and ultimately choking. It really was that funny. There is also only a hint of romance, so those who find that “not their thing” will get a break from love triangles and the like. “Don’t Get Caught” is one of those rare books that will hold universal appeal. The target audience is high school and up, but almost every adult will also enjoy it, even if they are not necessarily fans of young adult books. If you like humor, you will probably like this. Also, if you have a reluctant reader in your life get this into their hands as soon as you possibly can. It’s the type of book that can help foster a lifetime love of reading.